specifically to your child while they are engaged in meaningful play. Creating Color Sensory boxes are definitely good for learning colors, but they are also a TON of FUN for older children who already know their colors! 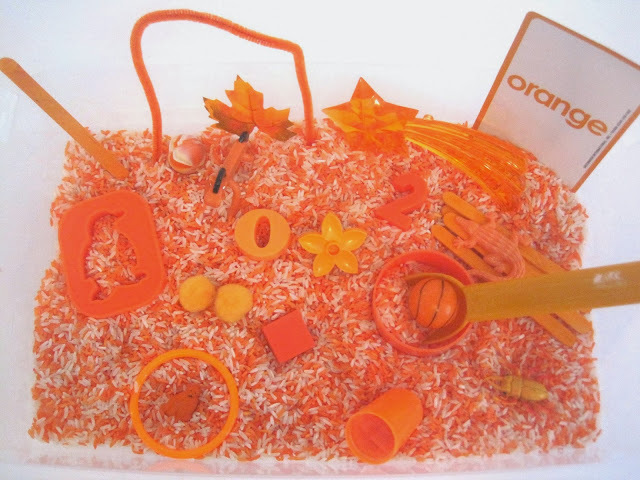 Imagine a child getting a sensory bin in his/her favorite color? They would stay engaged while you scaffold their learning! 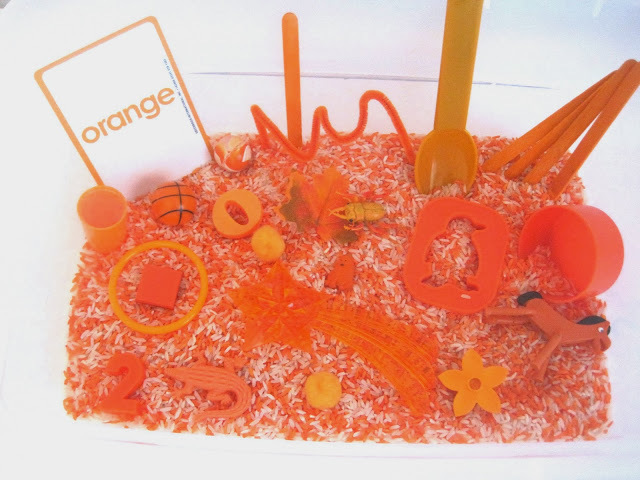 You can also choose to do a neutral filler for an orange box such as; sand, pasta, oatmeal, beans, cornmeal . . TIP : I like to mix sensory fillers so that there is more to explore, and because bigger fillers such as shredded paper, can be easily separated from smaller ones such as rice during clean up and resetting the box. rocks, wood, fabric, twigs, pine cones, shells, leaves, grass, seeds . . . 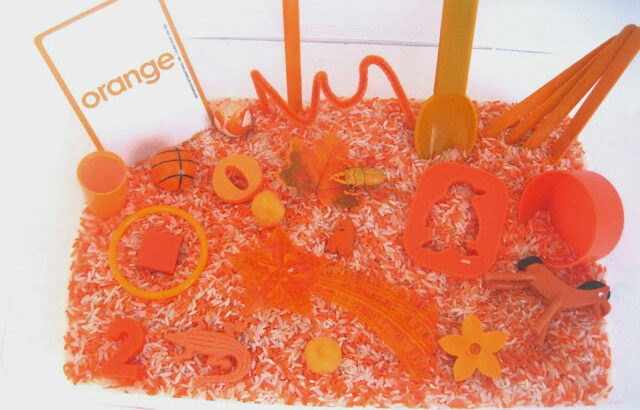 TIP : You can mix paint and water or food coloring to wash natural items such as wood, rock and shells with orange. Add various sized containers and ice cube trays to sort and hold small objects. 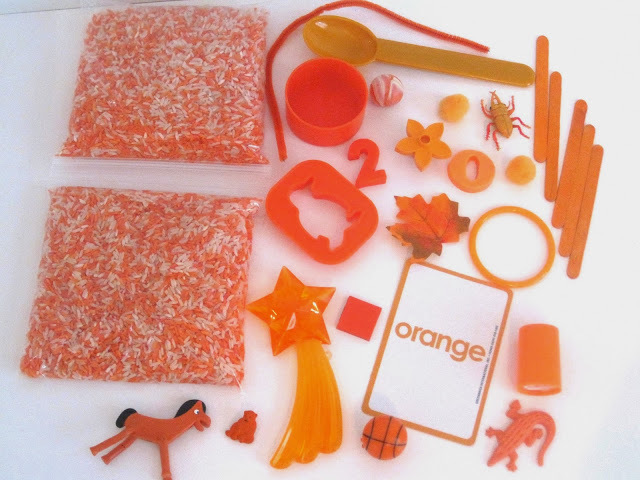 Now, add the ORANGE items. You want your child to be able to find and create patters (big, bigger, biggest, for example) and have the sensory box sustain their attention. You can get items from around the house, like the “junk” drawer and the bottom of the toy chest. Collect the small items from party stores, hobby stores and more. You can paint objects that are a different color with paint so that they match. Flash Cards, Scrabble Tiles, Geometric Shape Pieces and other learning materials. Cookie cutters are fantastic because they encourage children to crunch down into the filler and experiment with making shapes and using pressure. 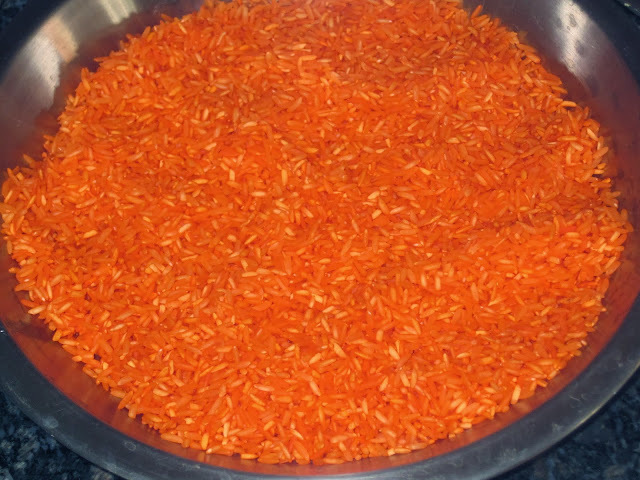 You could use scented items or spices in small jars (pumpkin, orange, carrot) that are associated with the color. TIP : Keep your items and fillers separated in plastic bags or containers, then you can use one big bin/tub for your various themes and mix and match items and fillers as you create new ones!